Who says you have to spend money to have a unique business card holder? All you really need is an Orbit gum pack and some elbow grease and you’ll be one your way to being the life of the party; or at least on your way to saving some cash. If you’re too cheap to buy a pack of Orbit gum (I recommend the Bubblemint but have been dying to try the Mint Mojito), then ask around on Freecycle.org or steal a pack from your roommate or fellow cubicle farm dweller. Step 2: Prepare Orbit Gum Pack for Hacking! If you haven’t done so already, shove all 14 pieces of gum in your mouth or offer them away to those individuals in dire need of fresh breath; in other words, do whatever it takes to responsibly empty out the pack. Once the pack is empty, carefully remove the inner foil lining by gently pulling it out. One of two things will happen when you insert your business cards; either they will fit perfectly and you’ll be able to close the pack, or they will be too big and you’ll be upset that I didn’t warn you about the possibility that your business cards would not fit. If you’re part of the latter “does not fit” group, then keep reading because you can still make use of your empty Orbit gum package! If you’re one of the lucky lads and ladies whose business cards fit, then feel free to check out the alternate business card holder below. By the way, it appears that business cards from VistaPrint or any business card sized 9cm wide by 4.9cm tall or smaller (like MOO MiniCards) will fit just fine. If your card doesn’t fit or you want to continue your hacking spree, then check out Step 4 after the alternate business card holder below. 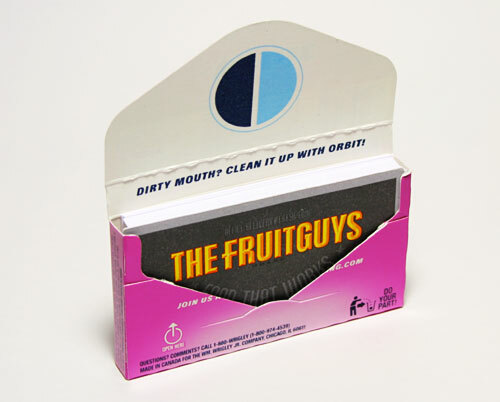 ALTERNATE VERSION: To create the alternative version shown above, simply grab an X-ACTO knife or razor blade and separate the glued flap of one side of the Orbit gum package from the back of the box. *HINT* Use a sawing motion and be sure to hold the blade straight as it is easy to cut into the cardboard. Also, be careful not to slice yourself in the process; we wouldn’t want your new business card holder soaked in blood. Once you have separated the side flap from the back of the box, simply glue the lid to the back of the box and trim the side flap to your liking. *HINT* I trimmed the flap way too small (as shown below) so feel free to leave some extra flap if possible; leave enough so that the new “side lid” easily closes and opens. 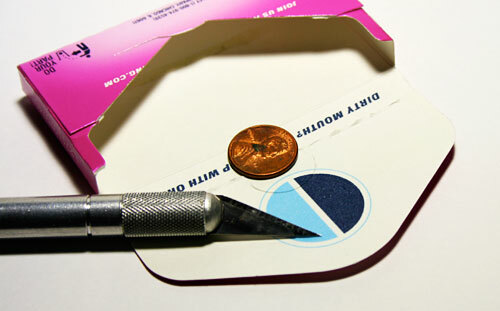 For this simple hack, grab a penny from the depths of your couch or your favorite penny jar and use it as a guide to cut a semi-circle in the flap as shown below. Then, trim away a bit of the package to allow the business cards to be more easily accessed and seen. There’s no exact science to this, I just cut from one edge to the center of the box as shown below. Next, find a thumbtack and use it to hang the display—you guessed it—as shown below. Finally, stick a business card in the semi-circular cut you made and behold your nifty business card display! 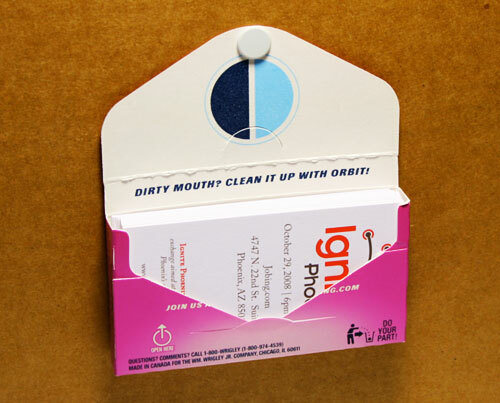 If you really wanted to get fancy, you could write “Take One” somewhere on the display or deck out your Orbit gum package with some scrapbooking paper and supplies. Regardless, I hope you found the DIY useful and as always feel free to leave your ideas and tips below. 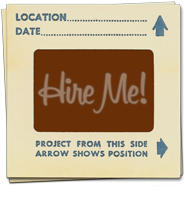 Post Scriptum: Be sure to check out 12 Unique Business Card Advertising Displays for more ideas. Amazing, it would be interesting to figure out how much money I spend on needless new items each year that I could do without with just a little resourcefulness. Thanks for the encouragement. @Josh – I know what you mean. I’ve made it a personal goal to only buy something new if 1) I’ll truly make use of it and it won’t end up on a shelf or in the garage collecting dust, and 2) I don’t already own something that can be re-purposed to do the job. whoa cool, i’m gonna try this out tonight! p.s. my editor brain is asking: isn’t “mint mojito” redundant? As far as “mint mojito” being redundant, I guess it is – maybe it’s not as redundant as Sahara Desert, Ackbar the Great, or Rillito River but redundant nonetheless. I’m wondering if Orbit used “mint” to ensure that people who have never heard of a mojito wouldn’t be left out in the dark – who knows though? This is absolutely brilliant! I stumbled upon this site through some twitter post, and I think t was a sign. I looking forward to the other tid-bits I’m sure I’ll discover here. I’m definitely going to try this out! 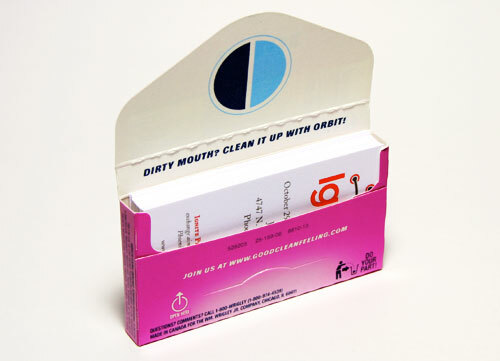 Unfortunately, some of the business cards I have are a bit too large for the Orbit gum pack but several people have created a template that you can print out to make your own Orbit style gum pack and I’m thinking of putting a custom one together. Anyway, I thought I would put that out there just in case the Orbit gum pack isn’t large enough to accommodate your business cards. That’s a fun hack! Any ideas on what to do with those tubs of 60 loose pieces of gum like Eclipse? There’s got to be a great way to recycle those bad boys! 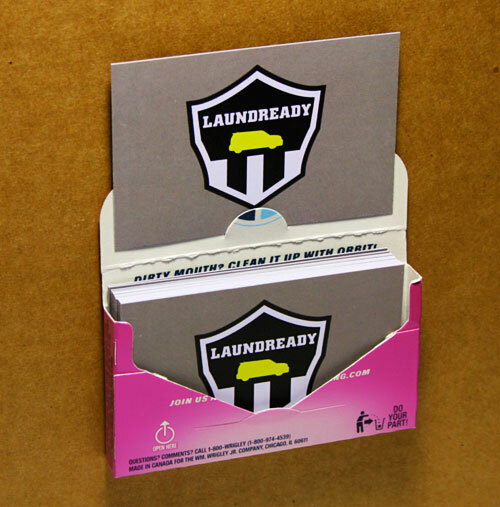 …and you forgot to mention, the business cards end up smelly nice and minty…or bubblegummy! I’ve been doing this for years and thought it was an original idea until I googled and hit your site. Spread the word!